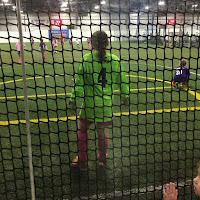 Everyday Nothings: Girl Scouts, and Homeschooling, and Soccer, oh my! Girl Scouts, and Homeschooling, and Soccer, oh my! I'm trying to find Jena a new Girl Scout troop, as her current troop is dissolving at the end of this year. Jena in her Brownie uniform. She's a Junior now, but quite frankly I love this picture. I don't really care if it's a homeschool troop, as hers currently is, but... it kinda has to be. With her playing (and loving) soccer, plus other family obligations, we currently only have two nights at home most of the year. I'm not willing to give those up in order to add another activity that just keeps us busy. So... I kinda need it to be a homeschool troop, because I need one that meets during the day on a weekday. Apparently we may be the only such troop in the area, because so far I've had no luck, and I've stretched my search to an hour drive in all directions. Still no luck. We like Girl Scouts, but I need to have a heart-to-heart with Jena about just how much she loves it. Because right now it looks like my only option might be to start our own troop, and I'm not about to do that unless this is an activity that Jena is really wanting to continue. It's a big commitment for us to make as a family if she's not 100% into it. So we shall see. Homeschooling is going well. We're behind a bit from where I would like to be in the curriculum, mostly due to my health issues. I've had five surgical procedures since October. That puts a damper on our schooling schedule. First day of Preschool and 3rd grade, respectively. Thank goodness last year I made the decision to school year round. Our school year runs July 1 - June 30, and somehow, even with all the "breaks" we've had, we only need 21 more school days to satisfy the state requirements. Praise the Lord! And we have more than 3 months to get those days in! I don't know how we managed it, because quite frankly it feels like we hardly ever school, but I keep record of everything she does, and numbers don't lie. Even though we do school year-round, meaning we won't stop just because we meet the state minimum, it is still a huge relief to know that we are more than on target to meet it. I will say that one thing that has also helped is that this year we joined Classical Conversations. The community days provided Jena with one day of school each week, even when I was out of commission. The director and Jena's tutor were very gracious in working with us (parents are supposed to remain on campus) and allowed Jason to drop Jena off in the mornings when I could not attend and pick her up when he took a break for lunch (our session ends right around lunch time). We didn't plan on things like this when we started, but it really ended up being a God-send. Back to soccer for a minute. I'll be honest, I really never pictured Jena as a soccer player. But she wanted to try a couple of years ago, so we signed her up for the YMCA league. And... she loved it. And... she loved being goalie. Not an action shot, but I love this pic of her. Fast forward to now, and she plays in a recreational league Spring & Fall and a select league for indoor soccer during the winter. Currently she's her team's only goal keeper, although the coach plans to rectify that once spring practices start, which is any day now. Actually they were supposed to start last week, but have all been cancelled thus far due to crappy weather. Anyway, I am proud to say that Jena is not only the only goal keeper currently, she's a super star. 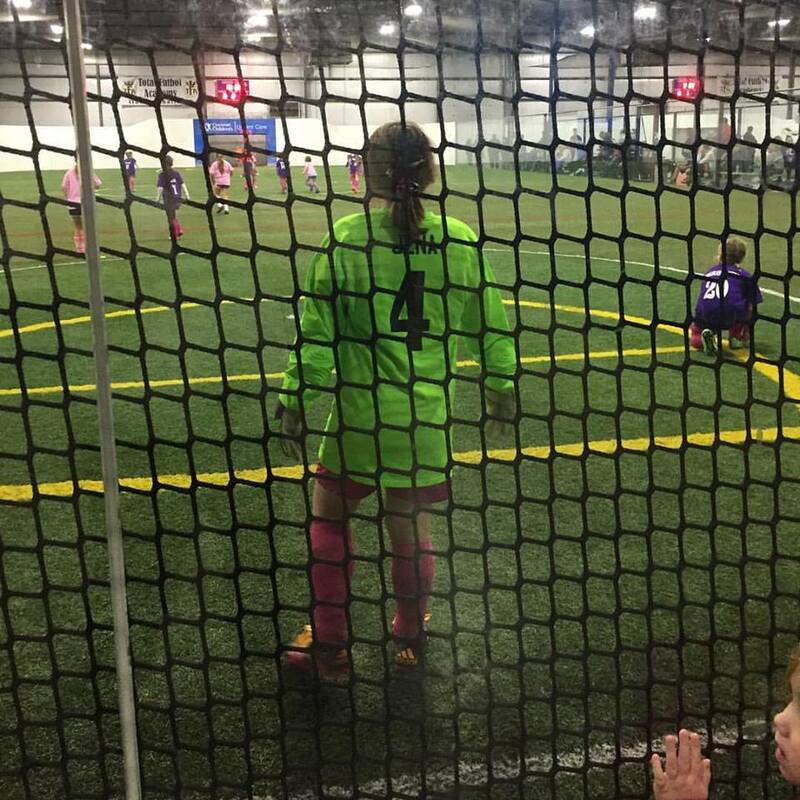 She may very well be the best goalie in her age group in our entire area. She started this season of select soccer with three shutouts in a row. Stopped 100% of shots on goal. We haven't started keeping stats yet, but I'd say her average is well in the 90% range. Her last game her team played an opponent that was in an older league, and played a much more physical and aggressive game than our girls are used to. Jena stopped 23 of 26 shots on goal. I even heard several of the opposing team's parents commenting on how good our goal keeper was. Yep. That's my girl. Oh, and because anytime Jena has a high number of stops I hear this comment, I'm gonna go ahead and say that her defense did not let her down. Those girls worked hard and get credit for keeping even more shots coming her way. This was an older team that played a tough game. Anyway, we haven't started keeping stats yet, because, well... she's 8 years old. But she has asked us to. She heard us (and her coach, and other parents...) using the word "shutout" after those first few games, and decided she did want us to keep track. Jason and I are toying with the idea of keeping track starting with Spring season, not only because she wants us to, but also because if she decides this is something she wants to continue to pursue, knowing how to do it and do it well will serve us well in the future, so figuring it out and practicing keeping track now may be a good idea. You know me, I'm a planner, LOL. My only hesitation is that she is still very young, and while I know she has a competitive spirit, I want her focus to remain on having fun. I don't ever want it to get so competitive that it ruins the fun for her. On the other hand, since she does have a naturally competitive spirit, she may think it's more fun. Who knows. So that's what keeps us busy most days. I don't know what we're going to do once Jillian adds her own activities into the mix!